We were approached by a wholesale paper merchant that were looking for some software to help run their business. The software needed to manage their stock and customer database, allow the staff to create orders, pass those orders to the production team as well as confirm the orders by email to the customer. they also wanted the customers to have access to certain lines of stock via an online web portal which would allow them to process orders themselves. The final bits of functionality required was for the production workers to be able to print A3 delivery labels that are attached to the reels. This needed to be done in such a way that the team could not break a template as was happening on a regular basis with their current setup. Finally they needed to be able to export all the data for the accounts team in a format that could be used with Sage. Following meetings both on site and at our offices to discuss the functionality of the system we created a detailed wire frame design that detailed the data flows and relationships of all the fields to be included within the solution. Once we had a system design in place we then decided that it would be best to base the solution of the Laravel framework. This would give us excellent flexibility in a cloud based environment and would definitely suit the solution CT were looking for. Laravel would also be great should they wish to add App’s or other functionality to the solution at a later date. As this system was to be the core operating point for the business, ease of use and efficiency were important factors. For this reason, all index pages on the system were built with live search, so that the results were returned quickly. 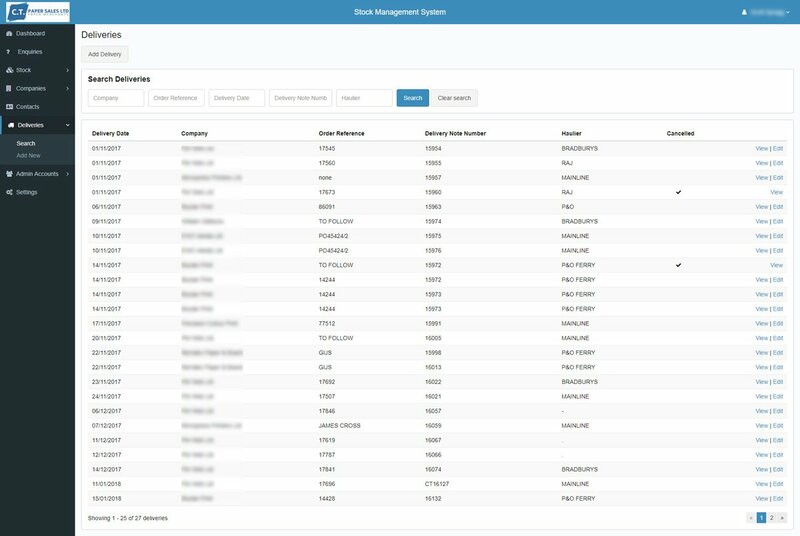 We also built in user roles, so that certain aspects of the system are only available to the correct user; Clients can only view the portal; admins can access the core parts of the system and super admins can additionally manage admin accounts. A core part of the system is the stock section. Admins can add, edit and delete multiple stock items. Stock items can be easily added to an order or marked for allocation at the click of a button. The client section also allows admins to manage their client base. Companies can be managed along with multiple addresses and contacts per company. A delivery section is then used to manage orders already placed; delivery note PDF’s can be generated within the system and then emailed directly to the client. The system is then managed by a settings section that allows logo’s addresses and telephone numbers used throughout to be edited as well as selecting which administrators receive notifications from the portal. The client portal allows clients to log into the system and place orders of the stock they require. Enquiries are then sent through to the admin screens with a notification received for each new enquiry. The admin can then accept or refuse orders. If accepted, the orders are automatically added to the system. To read more about the services in this article. check out our Services pages!